Main Attraction: Incredibly close proximity to Bryce Canyon National Park. We were a bit worried about finding a good campsite for boondocking near Bryce Canyon National Park because there was not much in the way of BLM land surrounding the park. We got onto our go-to website, freecampsites.net, to see what the area had to offer. 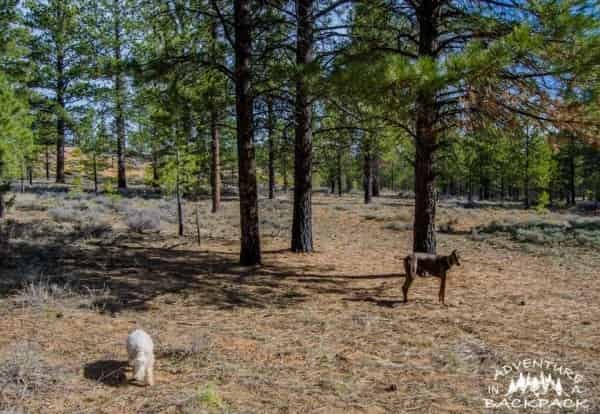 We were surprised that there were actually several dispersed campsites around Bryce Canyon National Park that were located in National Forest land. We found a pretty stellar campsite! Make the most of your boondocking experience. Check out our Van Life and boondocking must haves HERE! Less than a half mile away from the entrance of Bryce Canyon National Park, we scored big time on this boondocking campsite! 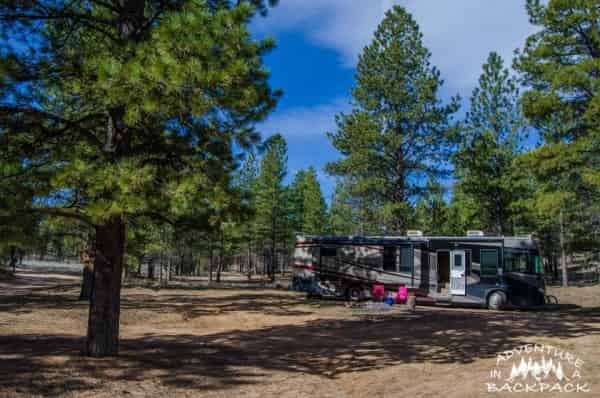 There were plenty of RV parks in the (ahem, very gimmicky) town of Bryce Canyon City, but why pay to park your RV when you can camp on free public land with no neighbors on top of you? Of course, sometimes RV Parks are necessary, but for the most part, we choose dry camping/boondocking as often as possible. Anyway, back to the beautiful campsite! Be sure to always practice Leave No Trace principles when using these campsites and respect the nature around you. Fire Road 090 is just 100ft north of the ‘Welcome to Bryce Canyon National Park’ sign on Highway 63, about a mile north of the actual entry gates and pay station. The road will be on the west side of the Highway (and may be unmarked until you get further down the road, there is a cattleguard about 100yds down this road). This campsite is actually CLOSER to the national park then the RV parks, so major bonus! The Fire Road has several campsites all up and down it, as well as on the other Fire Roads that branch off of it. So you shouldn’t have any issue finding somewhere to pull in. The campsite we found was actually the second one you come to (we passed up the first for being too small for our rig). It’s wide open and backs up to a big beautiful hill. During your visit to Bryce Canyon National Park, check out Fairlyland Loop for some great hiking! 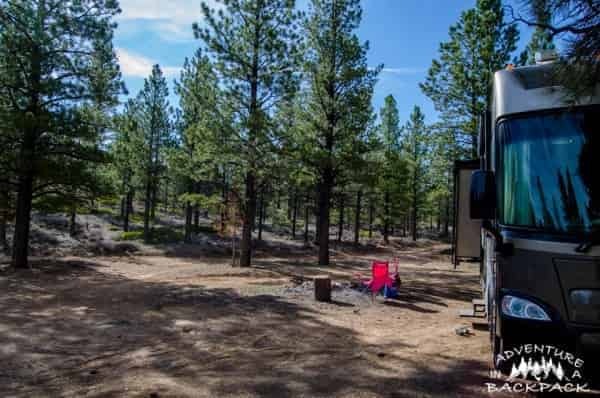 Finding a beautiful spot like this for boondocking near Bryce Canyon National Park seemed like we hit a jackpot, especially during National Park Week. There were several other campsites, but they were well-spaced and we never even heard any of our neighbors the whole time we camped there. There were also very few cars coming up and down the road, so it was very quiet in general. During the day, we left the door open so the dogs could come and go as they pleased, and they never got out of our sight-range and verbal range. They certainly enjoyed the freedom to sniff around and lay in the sun! Want to know how we find these awesome campsites? Check out our video on How to Find Free Campsites! Gorgeous place, thank you so much for sharing your awesome find! We will be there in August and I’ll let you know how it is then. Hopefully there will be an empty site for us! I certainly hope so! It’s such a beautiful site and so close to the park! 🙂 Let us know how it is! I appreciate your post as it helped us find a site in a pinch. However when dry camping you should never pilfer the natural forest for fire wood, leave garbage behind, or freely defecate and urinate in the camp sites as this has lead to many disbursement camps being shut down near Zion and arches national parks. For what it’s worth we drove around and noticed many beer bottles and one empty camp site had trash bags left behind. Great Place!! Thank you for sharing? Any boondocking places near Grand Junction, Colorado?? Looks like a great spot. Can you just turn up and is there usually space for a campervan? We will be travelling there end of August 2017? Yes, there are several spots that are large enough for a campervan or even a large motorhome. It’s first come first served, but there are a lot of spaces there to choose from. HI Liz…..question do you think we could get by with just our RV or do new need a vehicle to be able to get to the hiking trails, etc? Thanks! There are a few hiking trails in the area that you can walk to, but the majority of the park is further away. So depending on how far you are willing to hike extra to get to the park, it is doable for the outer trails. The visitor center is past the entrance by a couple miles, so you’d probably want a car for that, or just plan on longer hikes. The whole area is beautiful though. Worked out perfect. What a chill spot. I enjoyed your video so much. We are 78 years old and traveling in a class c motor home and will be checking out the space at Bryce. Is there any thing you can recommend around Canyonlands Park. We will be going there next. It helps us when you are living on a fixed income. Thank you for all the trouble helping others. ? we will be heading back to our home in Arkansas after Canyonlands. We are traveling with my son and his wife in their motor home and they will be going back to their home in Austin Texas.